On January 9, 1786, thirty-five “Men, Women, boys and Girls” from Angola climbed aboard a small brig in Kingston’s busy harbor and returned to sea. They had recently survived an Atlantic crossing to Jamaica with hundreds of other captives, but the vagaries of the Atlantic slave market split them off for another voyage. Embarking on this second ocean passage, the smaller group of captives climbed aboard a much smaller vessel, called Mars. The crew also packed the hold with goods, so the Angolans maneuvered around barrels of rum, sugar, and pimento. The observant among them gleaned from the sun or stars that this new voyage carried them north, instead of west. They surely noticed a change in the weather. Winter gripped North America, and even in Georgia that January, locals remarked at “the severity of it.” The Mars rocked and thrashed in violent waves whipped up by storms out of the northeast. Frigid rains and high seas drenched the deck with water that dripped and sloshed into the hold. Contrary winds caused an unexpectedly “long passage.” Provisions ran low. The crew headed for the nearest harbor, but one of the Angolan women succumbed to cold or hunger and “died two days before [the Mars] got into port.” Mercifully, the other thirty-four prisoners survived to reach Savannah, Georgia—probably unaware that their intended destination had been a place called Charleston, farther up the coast. The merchant in charge of selling the survivors perceived them as “a very slight made People,” probably because their passage from Jamaica on short rations made them appear so. One man died “a few days after they arrived.” The others recovered enough for sale into American slavery, but it would eight months after sailing from Jamaica before the last of them sold. As typically told, the story of the Atlantic slave trade ends after the ocean crossing. A transatlantic slave ship glides into an American port, planters flock to an auction on the pier, and enslaved people presumably march with new owners to nearby plantations. Slave trade histories usually end with such a sale, but for hundreds of thousands of enslaved African people the journey did not end there. Labor-hungry plantation owners were not the only buyers of weary survivors of the Middle Passage; merchant speculators sought human commodities as well. Port records, merchant papers, and imperial correspondence all suggest that a thriving intercolonial slave trade dispersed as many as a quarter of the African people who arrived in the New World, extending their dangerous journeys to American plantations. Such “final passages,” after the Atlantic crossing, occurred for a variety of reasons. Some colonial markets were too small to attract vessels directly from Africa with hundreds of slaves, but could be profitably targeted by intercolonial traders with a few enslaved people and an assortment of goods; some European empires enjoyed stronger trading positions in Africa than others, creating supply and price discrepancies across imperial borders in the Americas, setting the stage for smuggling; some important sites of American slavery were inland, requiring overland distribution after the Middle Passage. Whatever the reasons, colonial port records document more than seven thousand such shipments originating in British American colonies alone. Thousands more ventures surely occurred—in other regions and in periods not covered by surviving records. Most straightforward, for decades after Curtin’s book appeared, slave trade scholars focused on the so-called “numbers game,” with one scholar after another revising Curtin’s estimates. Some used census records and demographic modeling; others counted the captives in port records and shipping returns. Such efforts culminated in Voyages: The Transatlantic Slave Trade Database (www.slavevoyages.org), spearheaded by David Eltis, which seeks to document each individual voyage that carried Africans across the Atlantic. It is a prodigious work that documents more than 35,000 slave-trading ventures. The database improves our knowledge of the trade’s scale, organization, and mortality, and it stands as a monument to scholarly collaboration, with dozens of researchers contributing data. Despite these virtues, however, the database is limited to voyages that crossed the Atlantic—omitting the intercolonial trade—perhaps because that is how Curtin framed the question that launched the field. More surprising perhaps, critics of such quantitative study have also focused on the Atlantic crossing at the expense of other phases of the trade. In recent years, a rich historiography has called for moving beyond the counting of enslaved people crossing the Atlantic to achieve a more humanizing portrayal—one that reckons more with what enslaved migrants endured, how they understood their journeys, and what cultures they carried with them. Marcus Rediker’s The Slave Ship: A Human History (2008) and Stephanie Smallwood’s Saltwater Slavery (2009), for example, focus explicitly on lived experiences aboard slave ships, on putting a human face on the millions of people who had been counted by other slave trade scholars. Yet these works, too, stop after the Atlantic crossing. They describe the infamous Middle Passage, but do not examine the networks of dispersal that forced beleaguered men and women onward—from Barbados to Savannah, from Jamaica to Panama, or from Charleston to the North American backcountry. Yet hundreds of thousands of enslaved people did move on. Weary, often ill, angry, and often terrified, they arrived in a first American port only to be purchased by intercolonial speculators. American traders bought enslaved people in one port for transshipment to another, adding additional weeks and new dangers to the voyages of captives. Mortality in this intercolonial trade was devastating for people already debilitated by the Middle Passage. Furthermore, dispersal after the Atlantic crossing often separated transatlantic shipmates who shared language, culture, or even ties of kinship. And the importance of such intra-American trafficking extends beyond the devastating experiences of captives. The intercolonial slave trade spread the institution of slavery to new colonies and helped colonial merchants elaborate their trade networks. 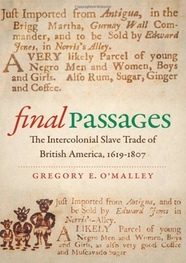 Many general traders in the Americas (and imperial policymakers) saw such slave trading as vital to opening a broader business with new customers, entangling the profits of slave trading with all manner of other commerce. There is a certain irony to slave trade scholars focusing only on the Atlantic crossing—an irony captured in the phrase used to describe that journey. For most twenty-first-century readers, “Middle Passage” conjures thoughts of the horrific experiences of African captives in their forced Atlantic crossings, but the voyage was termed “middle” to reflect European, not African, experience. For European traders the transatlantic voyage typically formed the second leg of a three-part journey: a first passage, from Europe to Africa with trade goods; a “middle” passage, from Africa to America with slaves; and a third voyage, from America back to Europe with colonial staples. This “triangle” trade gave the Middle Passage its name. Despite these Eurocentric origins, scholars have claimed the term for the slave trade’s victims. But ironically, “Middle Passage” actually fits the experiences of African migrants better than most scholars have realized. The journeys of enslaved Africans did not begin at their ports of embarkation for the ocean crossing, nor did they end when transatlantic vessels reached the Americas. Instead, people often fell into slavery deep in the African interior, facing a first passage to the Atlantic coast; likewise, many enslaved people spread outward after the Middle Passage, often settling hundreds or even thousands of miles away from their first American landfall. Understanding the African migration experience—and the full profits of slave trading—requires reckoning with these final passages after the Atlantic crossing.